The unique Barefoot – The House Collection 2017 showcase will be held tomorrow (11 November) at 7:30 p.m. at the Barefoot Garden Cafe. Barefoot has been working this way for 52 years. This year they want to show you how they do, what they do and why their clothes are so diverse. Barefoot hand weaves both coarse and fine warp and weft textures and their handloom fabrics are characterised by the vivid use of colour. Most of their handloom fabric is made from 100% cotton. They also weave a small amount of silk and cotton. Barefoot design is inspired by the land and seascapes, marine life, flora and fauna of Sri Lanka and they translate these into abstract geometry to produce beautiful and useful hand woven cloth. Their collection of contemporary clothing comprises of on-loom finished, draped and stitched garments constructed from simple geometric sections of cloth. In creating clothes for men, women and children, they have attempted to revive traditional methods of design and construction using materials sparingly and maximising the sewing skills they value highly. 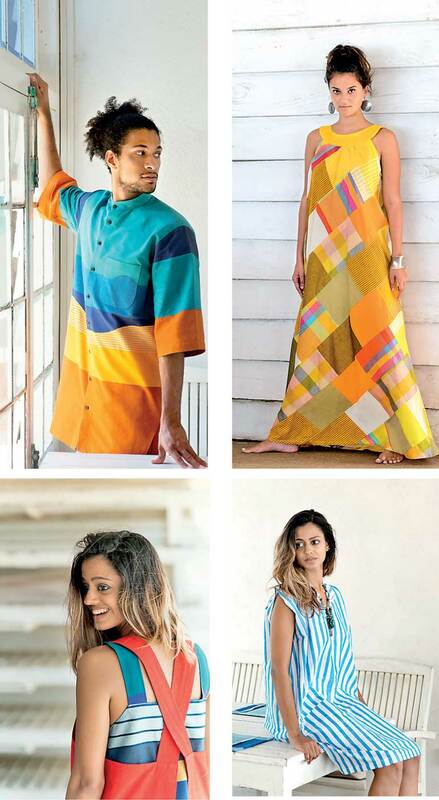 Ravithma Gunasekera’s collection is called Shaker Style and she uses whites, greys, blues and browns and little bit of checks to create a collection about the Shaker way of life. Simple clothes in pastels and soft colours because the Shaker people hardly wore any vibrant colours. Shakers made clothes thinking about their daily work and kept them simple. They are hardworking happy people. The jewellery for this collection will be by Sarika Durrant and brilliant hand-blown murano glass pieces by Aurora. Geni Raseens’s collection of crazy paving patchwork in vibrant colours is called psychedelic rainbow and induces you into one. Her patchwork is happy, fun, dressed up fantasy. Its beach party, flowing, free, asymmetric. A great deal of creativity in colour and shape make Geni’s clothes very special. A special collection of handmade macramé pieces will accessorise this. Nelun Harasgama Nadaraja’s works in black’s whites and ivory’s. Her collection is called Origami dervish. Her inspiration is a large piece of a square fabric folded into a piece of clothing. It’s simple yet complex, fluid and unstructured. Beautiful jewellery from Sifani Jewelers will add to the wow factor in Nelun’s collection. Marisa Gnanaraj’s, M FACT: Is a men’s wear collection called ‘Horison Infinity’ the primary inspiration for this collection is the desert landscapes and the colour pallet is a vibrant interpretation of the desert. The overall aesthetic of the clothes are a mix of tailored and oversize pieces along with handcrafted detailing. Vasantha and Kess who will do the hair and make-up have got a fab crazy vibe of colour and design for eyes and lips too and the exciting choreography will be by Anjuli Flamer Caldera and The Agency Sri Lanka. After the show Barefoot invites their guests to wine and canapés and there will be a pop up shop with the new collection for sale. Tickets are priced at Rs. 2,500 and available at all Barefoot stores Bambalapitiya and the Dutch Hospital, Colombo and the Galle Fort shop in Galle. Barefoot clothes are different. They are unique.